I woke up this morning still full from last night! That African food was dense! After a Green Monster and some internet perusing, I headed to the gym where I ended up doing 4 miles on the treadmill. My knees felt fine, probably because I did a run/walk combo (run 2 mins/walk 1 min). I’ve realized that complex carbs keep me full for longer. The past two days I’ve come home ravenous after a basically complex carb free lunch! So I’m going to try to incorporate whole grains and other complex carbohydrates into my lunches to see if that helps keep me from wanting to gnaw my arms off around 4:30pm. I made a delicious stir fry with a bit of coconut oil, garlic, zucchini, bok choy, scallions and Kikkoman Ponzu. 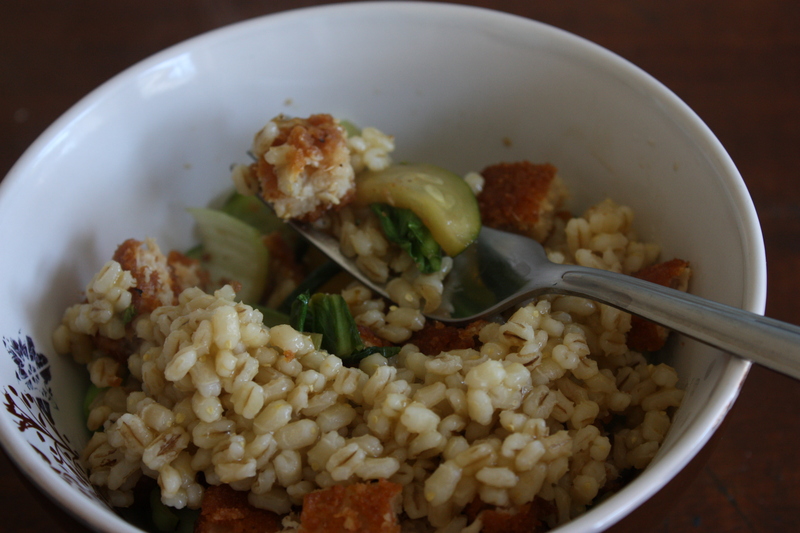 On top of that, I added a chopped up Spicy Chik’n Patty and helping of barley! Delicious! Very filling! Finished off the meal with two cuties and huge cup of green tea! I basically did nothing today… I went to TJ Maxx to return the fantastic red heels that didn’t fit 😦 and to Target to pick up some cleaning essentials. Pizza! Using this dough recipe from Eating Well. 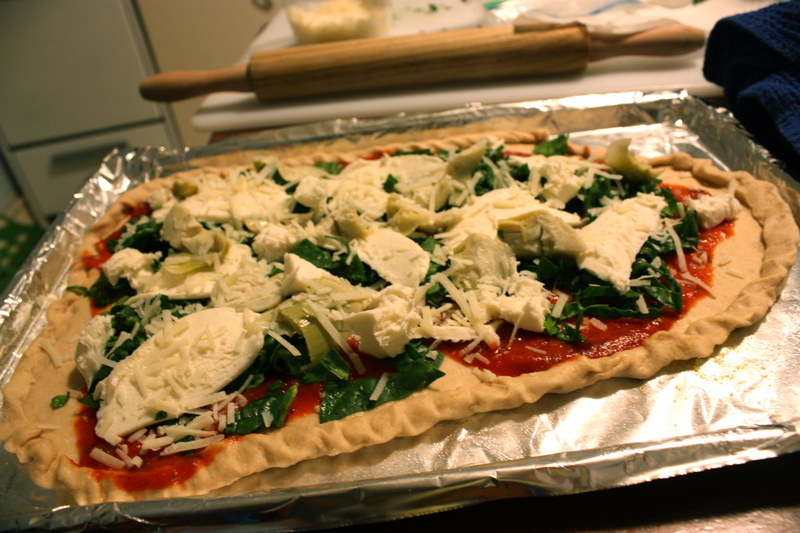 Toppings includes: sauce, a layer of finely chopped spinach, fresh mozzarella, chopped artichoke hearts, and grated romano cheese. 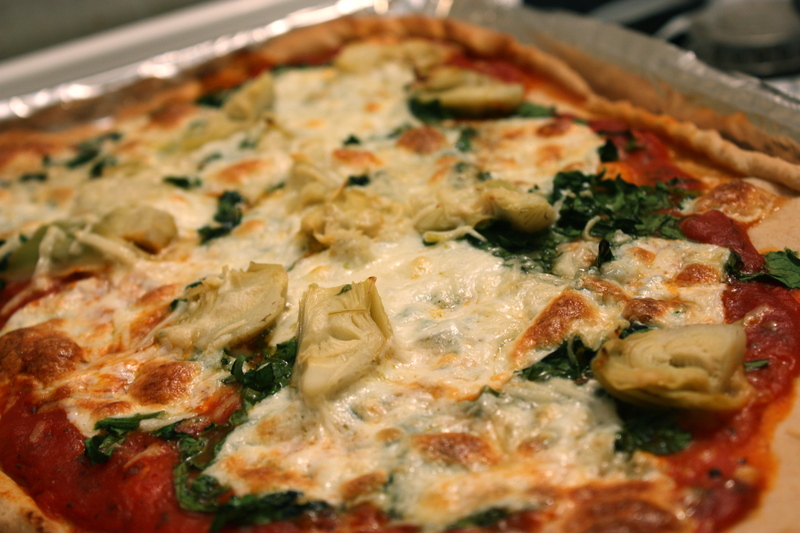 Artichokes make everything delicious! 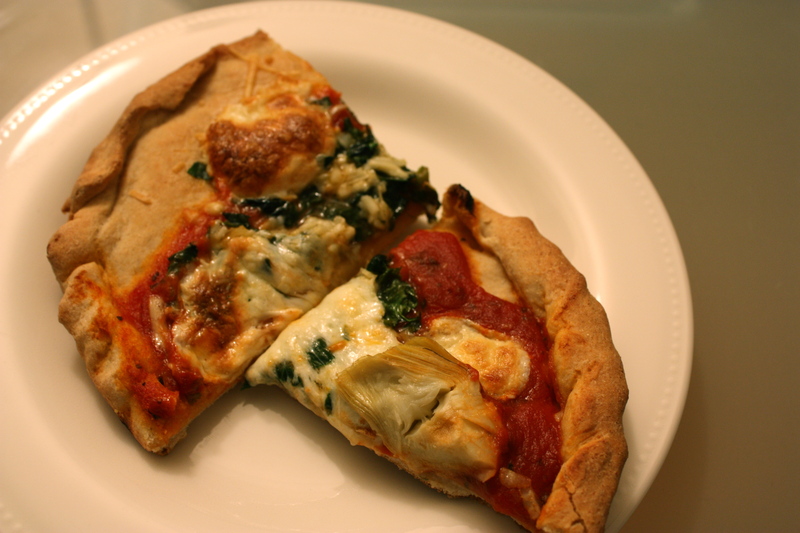 What are your favorite homemade pizza toppings? 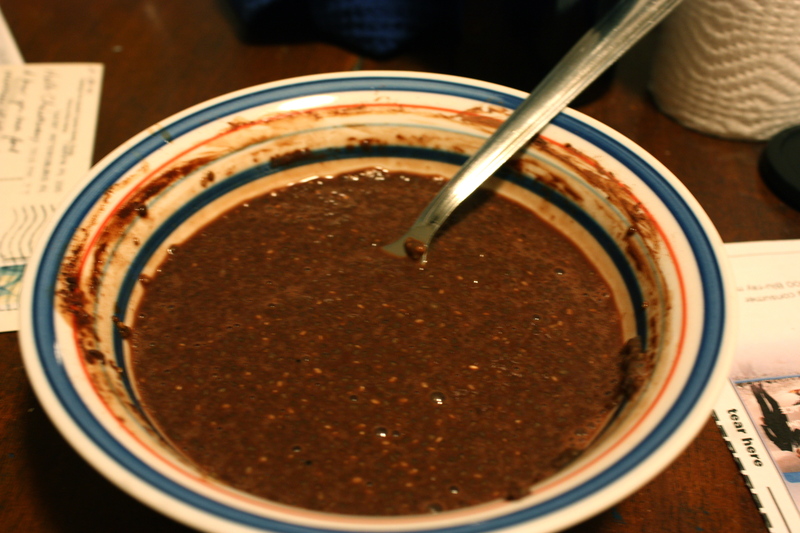 Sad to say this is the first bloggie recipe that I did not like. I threw it away 😦 Oh well! Can’t love them all! Since today was full of slacking, tomorrow is a study day. Dreading it already. The Oscars are on tomorrow! I can’t wait to see the dresses on the Red Carpet! Posted in: Uncategorized | Tagged: Dinner, Lunch, Nutrition, Planning Ahead, Recipe, Try New Things, Vegan, Vegetarian, Veggies! I love to mix barley in with my oatmeal. It’s so chewy! You’re the third person who I have heard about trying African food this wknd, random! I love putting spinach, peppers, shrooms and artichokes on mine. The more veggies the better! love barley! have never made it at home though. Yay! 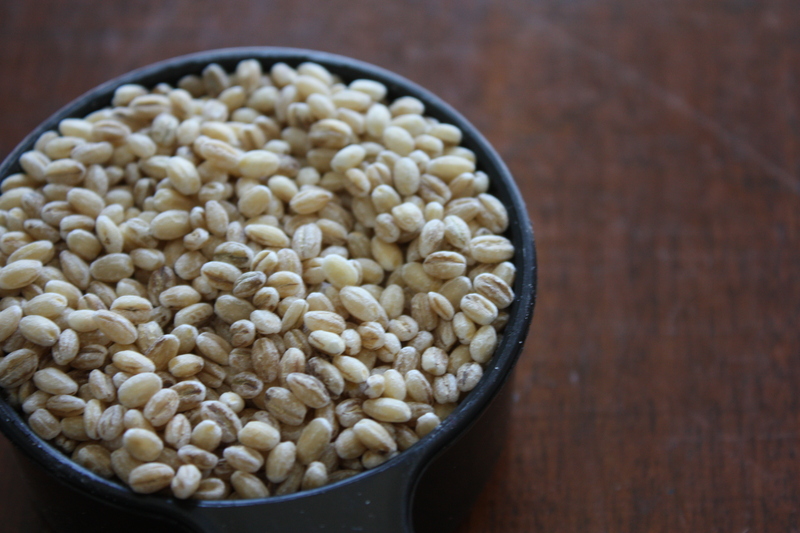 Hop on the barley train– I LOVE it! It’s great for breakfast too! Yum, that pizza looks amazing! I love barley too and should make it more often. Your pizza looks so good!! 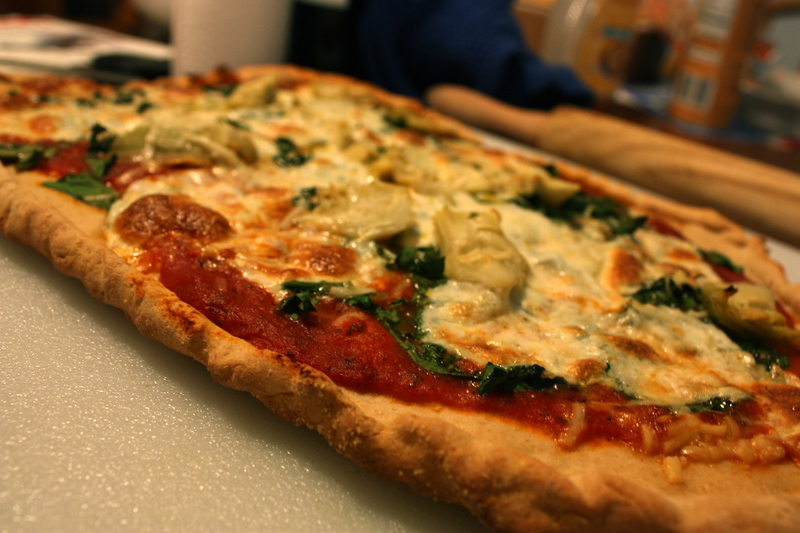 I like spinach, pepper, mushrooms, pesto sauce, mozzarella and.. well basically every possible veggie on my pizza.